After my nephew’s recent baseball tournament win (Go Armour! of Parker, CO), I saw some teamwork exercises that made it obvious they were not just winning baseball, (nationally ranked 3rd!) but raising winners who understand teams. Among other exercises, they had a “shout-out!” time where they sat in front of the coach, and each boy enthusiastically raised his hand for the pure enjoyment of telling what he noticed one of his teammates doing right. What a great idea! That coach is teaching a life-skill I wish I had known at that age! It is called edification. “Therefore encourage one another and edify one another, just as in fact you are doing.” (1Thes 5:11) Giving credit where credit is due is a trait often forgotten in this dog-eat-dog world. As a child, and unfortunately into adulthood, I remember feeling that if I lifted someone else, it made them think that I was less in comparison. But edifying others is quite the opposite: the more we lift, the more we are lifted! I love audience participation, so in this week of Mothers’ Day, I would love to SHOUT-OUT to some moms and ask you to do the same! It doesn’t have to be your own mom; it can be any mom in whom you see something to admire. Specific stories that illustrate why someone is great always inspire others and help us remember how to apply it! Before shouting-out praise for moms, I really want to lift up prayers: Mothers’ Day can be a time of sadness for so many – those who wish to be mothers and are not, and those who miss their mothers dearly. Please take a moment and send prayers their way–every day this week! Our prayers are with you, girlfriends! Please feel free to participate in our shout-out and I hope it helps uplift your day. No jealousy allowed. If you see someone singing the praise of someone you know, quietly tell God thank you for those two women lifting each other, and get your mind off yourself! God knows 🙂 . No negative. This is a general rule for shout-outs. You can’t start with “She drives me crazy, but…” No buts about it, shout-outs are positive! Write the negative in sand, and write the positive in stone – on a comment. You may have nothing positive to say about a mom except, “She didn’t abort me,” and that is a perfectly acceptable, wonderful shout-out!! Life is a gift, and God gave it to you through her. I don’t mind long shout-outs, so say it like you mean it!! You can copy this link and send it to the mom on Mothers’ Day as a special blessing. Here goes! I am writing about a different mom each night this week, hence the different color fonts. I want to SHOUT-OUT about Kerri Bosma of Michigan. 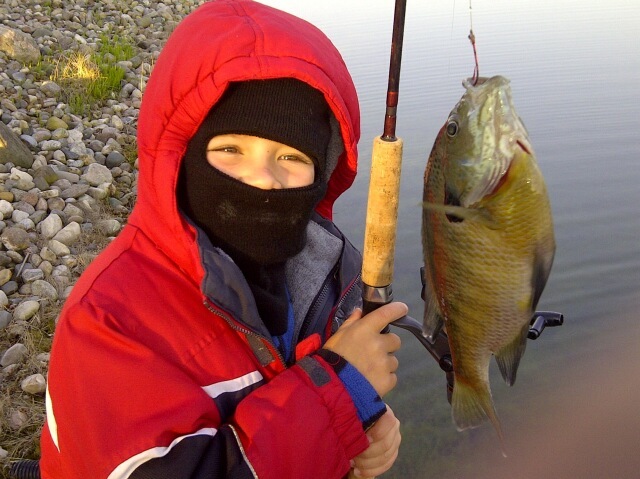 This mom took the letter, “Sunrise, Sunset, Fishing for Memories” to heart and then sent a photo of her son, Kayson, whom she took “early morning fishing.” What a catch of a mom! Maybe I should have mentioned that I meant fishing in Florida winter or Michigan summer, but not necessarily early morning Michigan winter!! Two thumbs up for that mom!! Attach a comment of your own shout-out to a mom and check back tomorrow to see my next mom shout-out. I want to SHOUT-OUT about this “unknown” mom I saw on a street in Colorado last week. Of course, to her, it may have been a “normal” morning exercise routine, but to me it was worthy of SHOUTING because I think she was seeking excellence in family, fitness and faith (LOL) all at the same time. Not only is she pulling her own weight, but the weight of Superman (complete with cape) and his sibling (or two!- I can’t see inside the trailer). Go, Mom, Go!! This shout-out goes to the special moms of children with special needs. Although I do not know her personally, according to the comment below from 5/9/12, Michele Lewis’s sister, Kim, is a foster mom who chooses specifically those children with special needs. What a special lady! I want to shout-out to moms who may never hear their child say, “Mom,” but God knows her name. These moms may have more doctors’ appointments than playdates, and have embarrassing moments in public, with intensely tearful moments in private. These moms may wish others would stop complaining about “Italy” when they are trying to stay focused on “looking for tulips in Holland.” These moms may have their brains stretched further than they thought they could go, and their hearts stretched to equal capacity, as they celebrate the simple things that moms who don’t have a special needs child would never know. Shout out to you, Mom! Your child is blessed that God gave him/her to you! dominoes for hours on end- even up to her dying days in her upper nineties in a nursing home. I can almost hear the sound of her voice when I sip her favorite drink, Dr. Pepper, because the taste brings a flood of memories. Her greatest influence on me by far was a devotional book she had. Each morning of that 7 day trip, she would have me read the book aloud to her (because “her eyes were bad”) and it was probably the most Bible I had read outside of a Sunday. I admired that and wanted to do it for myself. God used my grandmother’s 7 days with me to influence me for a lifetime. 7 days! As I grew, I remember thinking, “If Grandma needed me to read that book to her, how does she read it when I am not there?” and then I would dismiss the thought – because God planted seeds during that time that are still growing today. I love you and miss you, Grandma! and look forward to the day when we shall meet again. be nothing. (She made sewing cards for my daughter last year by drilling holes in the shape of animals out of empty Clorox bottles that she had cut into 4-inch square “cards”. I kind of wish I could have seen the 94-yr-old woman with the drill!) For her 90th birthday, someone gave her a new gun, because she shoots rattlesnakes, and for years, it has been with a crooked-barrel shotgun! She has written poetry that somehow mixes tears with the warm fuzzies of home. She quilts-by-hand at 20 stitches per inch, makes homemade cards for every birthday and has given a full-size quilt to every grandchild and great-grandchild. She has been a hero of mine for most of my life. My earliest memory of admiration was wanting to be “a farmer’s wife when I grow up,” according to my 3rd grade paper. 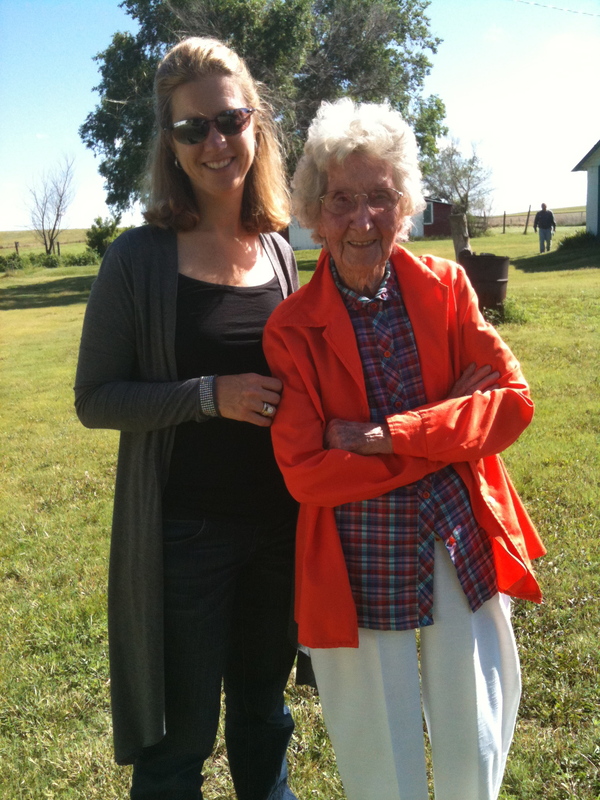 This shout-out goes to Grandma Fern Estes of Kanorado, KS! Jesus said, “What you have done for the least of these, my brethren, you have done for me.” My mother served “Jesus” on more than one occasion. Once there was a bad car accident on the highway near our neighborhood. We children heard the collision and ran to the fence to see. My mother followed through with more than rubber-necking. I don’t know if she jumped the fence, or jumped in the car and followed the ambulance, but I do know that the family that was far from home on vacation was hospitalized and released at different times from each other. My mother offered our home to the father and children while they waited for the other children and mother to be released from the hospital. In my memory it was months, but knowing how children’s brains work, I guess it was probably a week that this family “moved in” with us, with bandaged wounds showing, as they awaited the mother’s medical clearance. Mom had a dream to be a nurse, but when she was a teen, she came upon a bad car accident and fainted. Because of the experience, she “chickened out” from nursing school. The dream never faded, even after her courage had. Years later, when my oldest brother graduated from high school (and her youngest of four was in 4th grade), my mom tenaciously picked herself up by the bootstraps and went to college, 45 minutes from home, full time. She graduated from college as an R.N. the same week as her oldest child. “Shouting out!” about her kids has never been held back by my mom. She would tell a complete stranger in Walmart or Wendys (the two places I specifically remember witnessing!) all about her children and grandchildren’s accomplishments. She is president of 4 adult-children’s and 12 grandchildren’s fan clubs! I love you, Mom! Thank you so much to all who are shouting-out in the comment section below. Amazing stories about amazing moms! I have so much to learn! J.R. (at 3-yrs-old) summed it up best when he asked, “Who is God’s mommy?” When I told him God did not have a mommy, he replied, exasperated, “Oh, He must be so sad!” God truly blessed us when He gave us moms to admire. As mothers advance in age, I see a pattern of ailments that seem inevitable in my own future: Knees grind; a heart needs monitoring; hips that used to shimmy shimmy coco-bop, get stuck on the bop; skin gets speckled and thin enough to tear at a mere thought; bellies malfunction; brains fade; voices get hoarse, and sleep is hard to come by (at night anyway). It is as though a mother’s body is just …well-used. If my hips need replacing, may it be because they were first displaced by children. If my knees get sore, may it be from bending in prayer. If my belly is torn up, may it be because I took gut-wrenching pain away from my kids. If my voice gets hoarse, may it be because it was overused encouraging. If I can’t ever remember what I am going to say, may it be because my memory is full of the gifts of motherhood. If my skin gets speckled and soft, may it represent my buffalo skin fading away to allow true love to show. If my heart needs monitoring, may it be found exploding with gratitude. This entry was posted in Cute Kid Quotes, Motherhood, Personal Growth, Sister to Sister, Uncategorized and tagged Chris Brady, God, Life, Mental Fitness Challenge, Mother, Mothers Day, Orrin Woodward by Terri. Bookmark the permalink. You know Terri I have so many I would shout out to, Kerri Bosma being one for me as well. I would like to shout out to my friend Tina Hamilton, no relation. Tina is a new mother to a beautiful little girl named Isabella. Even though Tina and I have never met except for fb You can just tell she was meant to be a mom! I want to give a huge shout -out to my own mom. She has always given me the best example of what it takes to be a great mom- herself! A shout out about my Grandmother (who passed away 5 years ago ON mothers day) who personally inspired 3 generations so far of men and women who take prayer seriously and put their faith into action in their own lives due to her amazing example! To Evelyn McCuan Blevins! She rocked! Terri, what a wonderful idea for this week of Mother’s Day! I want to shout out to Stephanie Seely for being such a devoted mother. I think many phlegmatics really love their sleep (I do) but I see her sacrificing so much to be up very early reading, planning, organizing and spending an hour in her Bible each morning because she knows that taking that time for herself will bless her family. She is such an inspiration to me in the way she diligently teaches her little children to be kind, thoughtful, and always polite! Dear Terri, Your blog has gotten me thinking about all the moms in my life & how much I admire them. I want to shout out to Amber Harston who is a very dear friend of mine! I never even realized that I made such an impact on her & I was moved to tears to think she thought enough of me to write such sweet words about me on here. She is really the one who needs to be acknowledged for being a fantastic mom & friend! She home schools her 5 awesome children, is so patient with them & is always thinking of fun, exciting things to do for them. She is so good about preparing healthy food for her family & I admire her so much for her hospitality. She is incredibly busy & yet always makes time for others & I have never heard her complain! I have never seen such a godly woman who stands so firm in her beliefs & will not compromise them for anything. She always does what she says she is going to do & is constantly doing sweet things for me. I am so thankful and so blessed to have such an amazing friend in Amber Harston! This shout out goes to the number one mom in the world Mrs. Anna Pearl Potts, my deceased mother. When I think of a Woman After God’s Own Heart, her face appears immediately. If I ever wonder, how can I be a better wife to my husband, her servanthood is a reminder. When life spins out of control with Kids, chores, church etc her beautiful smile and soft voice clams my soul. And last but certainly not least, whenever I am feeling sorry for myself I am instantly reminded that my mother lost three children in a single accident, three others injured and hospitalized and didn’t lose her mind or her marriage but instead lived Proverbs 3:3-6 for others and me to draw strength from even years later. This shout out was written with Love and to give Glory to God for the blessing of my “momma” and “momma’s” of the world! Please allow me to shout out about my mother, Anita Miller, who is not longer here with us on earth, yet the world needs to know how her meek and humble spirit has influenced my life and continues to do so. Her example of a quiet and gentle spirit, bearing all hardship that came her way with patience, never trampling on others to secure her own rights daily inspires me to continue that legacy. Believe me girlfriends, I have a long way to go, since I seem to only understand the language of “Buffalo”, but it won’t always be that way as long as she was in my life! God gave me the greatest, most perfect gift, my mom. I don’t intend to waste any bit of it! Wow, Terri, what a wonderful idea thanks for the opportunity to give a public “shout-out” to some wonderful moms. Today, it’s my mom, Ethel M Daggitt. She has grown so much these last 10 years (in the very autumn of her life) that she’s an inspiration to all of us. She has started validating & edifying, serving many volunteer organizations such as hospice, soup kitchen, Senior Center group and visiting shutins. So proud to call her mom. She leads life to the fullest & serves HIM at every chance she gets. Thanks, Mom. I want to send a huge “shout-out” to my wonderful wife, Rusti Spence! Not only does she tolerate me and the heavy load I ask of her, but she is a wonderful Mom to four demanding boys! As a new Mom, I watched her live outside of her “comfort zone” as she was forced to learn “time management” skills and develop “scheduling” and organizational abilities that would rival any corporate CEO! Although a few years have passed since she dealt with a 4 year old, a 3 year, a 1 year old and a “new born” at the same time, her position as “Mom” is still a very demanding and labor intensive job! Rusti has become one of the most “selfless” people that I know. I have seen her give and give and give, when in reality I know that she feels like she has nothing left; but she gives anyway! She maintains a positive, loving and forgiving attitude, even when we have given her every reason not to. None of this has come naturally to her, yet she adapts, changes and grows as the situation demands. To this day, I bet I personally field 30 questions a day to which I answer; “I don’t know, you’ll have to ask your Mom”. Rusti always knows the answer! She seems to effectively juggle 18 million balls and makes it look effortless. Somehow, she makes the time to run a successful company, read for her own personal growth and to exercise consistently! She does this and all her “Mom stuff” while maintaining her priorities with her husband and to her relationship with her Lord and Savior, Jesus Christ. Our household would be lost without her and so would the five men in her life! In the words of her children, Rusti is “the bestest” Mom! She is the love of my life and I feel so blessed and privileged to be able to watch the “work of art” she is creating in a performance they call “Mom”! I would like to give a shout out for several moms if that is okay: My mom Kathy who is still selfless in her serving of her kids even today with most of them having their own kids now — she made me want to be a stay-at-home mom! My mother-in-law Patty who has for the last 11 years treated me as her own daughter! My sister Mandy who makes raising her daughter a priority even while working part time. And for my friend Renee who is just like a “mom” to her niece and nephew — her heart is so big for kids and I pray one day the Lord will bless her with her own children one day, until then she is loving the kids in her life as though she was their own mom!!! (She brags on those kids more than I do on mine!!!) I love and appreciate all the moms out there!! Thanks for your example and encouragement to me! Happy Mother’s Day! of her kids and grandkids until the day she joined the Lord has made miracles happen and lifes struggles seem managable. If you knew grandma was praying for you, things were going to be ok. She was an amazing example of love and taught me so many life lessons. Shout out to Grandma Bravo. Love and miss you so much!! I want to give a shout-out to my own mama first. She is one of those ladies that gives a ladies a good name. She has worked hard all her life, helped raise 6 kids, was a wonderful wife to my daddy (40yrs this year! ), & always sacrificed for the well being of her family. Looking back on my childhood, & remembering all the financial stife they went through, I am pretty sure she didn’t sleep for the span of a few years, between taking care of us & working a night shift. My mom taught me, her only daughter, what a good wife & mom is. When I think of the Proverbs 31 woman, I think of my mom. You will never hear the words, “I’m too old…” for any reason come out of her mouth. Even today she continues to learn & grow & become the best person she can be. I have learned so many great & wonderful things from my dear mama, & am forever grateful that God chose to bless me so much by giving me her. The first shout-out must go to my amazing wife, Lindsey (not the name-sake of this blog). She has sacrificed so much to be able to stay at home with our 3 children all day. She does a fantastic job with them, and while I know that it is by no means easy, she willingly takes it on because she knows it is the best thing for them. The next shout-out is to my mom. She has always been an amazing encouragement to me, even though I didn’t always want to listen. Her constant positive attitude was always a ray of sunshine growing up, and it continues today. I will be forever grateful for the lessons and principles that she not only taught, but modeled with her own life. I want to send a shout-out to my mom, Anne Krueger! She to this day tells me how proud of me she is and how much she loves me. Not only does she say it, you see it in her selfless serving of her family. To a words of affirmation melancholy her grace has been a blessing from our Lord above. Love you mom! What an INCREDIBLE idea Terri! I want to send out a GINORMOUS shout out to every courageous Mommy who strives to be a better mommy than they were the day before. To all the Mommies who find purpose in nurturing their sweet babies. To all the Mommies who sacrifice their time to give their children the quality time they so desperately need & want! To all the Mommies who make funny faces, sing happy tunes & dance uncontrollably because it makes their babies smile! To all the mommies that pretend to be dinosaurs, ducks, pigs & superheros (or is that just me??) because their children’s giggles is music to their ears! To all the mommies who aspire to be the best mommy than can be by constantly reading, learning, & studying. To all the mommies who stop to recognize the beauty in a hand picked dandelion bouquet. To all the mommies that teach their children that when you are in the service of your fellow beings you are only in the service of you God & to all the Mommies who give their children a Christ centered life. HAPPY MOTHERS DAY to all you incredible Mommies! And here is ONE ENORMOUS Shout-out to My Mom… This woman amazes me everyday with her continual sacrifice. She has the most beautiful servant heart & I am constantly amazed by her loving example! She is the best LOLA (Grandma) EVER! Anytime I am sick or need her terribly she changes her plans & is here helping with cleaning, cooking, & taking care of my kiddos! My Mom will call me & say “Do I get to watch the Boys tonight?” (usually for all our nights away for the business) She is incredible! The greatest thing I can thank her for is her incredible love for our Savior! She gave me such an amazing foundation of Jesus Christ & of Our Heavenly Father! For without this, my life would not be complete! Her solid testimony has strengthened me 100 times over! Thank you Mom for EVERYTHING!!! Thank you, Terri, for this wonderful Mothers’ Day idea! I have a couple of “shout outs.” The first is to my mother, Virginia Toering, who raised me to love the Lord, gave me a work ethic, taught me to survive the tough times by walking with Jesus, and gave me the gift of music! Now, to some very special moms I get to call my ‘friends’; Krista Beach, Beth Bauw, Erin Gregorski, Liz McPherson, Kourtney Cox, and Beth Morgan who do an AWESOME job of teaching their children to live LIFE with kindness, love, integrity, and excellence!! HAPPY MOTHERS’ DAY SISTERS! My first ENORMOUS Shout-out is to my very beloved Mom, Vivian Weinshelbaum, whom I love with the very core of my being. I was born at 7 months gestation during the early 1950’s. No one expected me to survive, let alone be considered “normal”. Mom never gave up hope for my life. She has been there for me through all my joys as well as the depths of the lows. Mom loves me, know matter what; just for being me. My next ENORMOUS Shout-out is to my awesomely incredible daughter, Valerie Etherton. Valerie is singularly the most “complete” woman I have ever known. Her marriage is of the caliber that few ever attain and I consider her hubby, Jason, the son I didn’t have to give birth to! Their daughter and son are joy personified. Most of all, my daughter didn’t give up on me when I was giving up on myself. Her love for me and her encouragement renewed my commitment to Christ and brought me back to a new and loving church after I had walked away from all church eight years previously. While I know it is more common for the older woman to teach the younger, my daughter has taught me immeasurably and to her I will be forever grateful. My mom, Sarah, passed away almost 22anything years ago when I was 13. In those last months, days even of her life as her body was giving in to cancer, she never once raised her fist at God. When friends & family came to comfort her, she was the one giving them comfort. She was 38, but in such a short lifetime she impacted so many for Christ. At her funeral there was standing room only~well over 200 people came on a cold blizzardy day to say good bye and heard the plan of salvation. and God’s amazing grace…I wonder how far her ripples in the water will reach. My two little girls know their grandmother ‘s faith and peace that passes understanding. I was so blessed to have her for those 13 years. Sending a shout out to my mom, Lori White. She is the glue that, with God giving her the ability/strength, has has been a big part of our family staying together thru some pretty rough stuff. I will love my children unconditionally, and let them know I do. I will believe in them constantly, and encourage them often. I will nurture my children in the truth of God’s Word. I will try to be an example of godliness and beauty, but I will be unafraid to let them see my faults. I will release them when they are grown, but they will always be my own. Thank you to all the mother’s who serve as a living example of what the title ‘mom’ truly represents. My shout-out goes to my team member, friend, walking/running buddy and my mother figure Donna Kuhtz. While this woman has two adult children my age and older, she still managed to help me through the most difficult times of my life and love me and care for me as a mother does her own child. Anyone can serve as a mom as long as they provide unconditional love to God’s children. Thank you Terri for being an example for all of us to follow! Mom does everything with Grace and when you meet her you will see the great work of Jesus Christ inside her! Thanks Terri for this opportunity to shout out about my loving and wonderful Mom, Diane Lobb. After her own battle with cancer where she always gave her illness over to the Lord, my parents found out that my father has dementia and has progressed relatively quickly through the stages. My Mom’s daily care of him is amazing. She makes sure she does Bible devotions with him everyday and prays with him. She is such an example of a godly servant. I am so thankful for her example in my life. It is comforting to know that there are wonderful people like my Mom who show their kids a long lasting devoted loving marriage through good times and bad. They will be married 48 years tomorrow. Thanks Mom and thanks again Terri. I would love to give a shout out to my sister Laura Aparicio Morfin. She has been a mom, a best friend, a mentor, a blessing for me. Her servant heart, her love for her kids and the respect she shows her husband, you all may know her God describes her in Proverbs 31:10-31. Love you sis. I want to give a shout out to my Mom. She buried her husband of 65 years two years ago. She walked in his shadow most of those years. Today, I see the smile returning and see her stepping out stretching and walking forward thru the example of many women who have walked that path before her. I have a shout-out to a Mom that will remain anonymous here, though I know she will recognize herself, should she read this. What a great idea!! I am blessed way beyond what I deserve to be surrounded by wonderful moms…those that are family and those that are sisters in Christ! I learn so much from each of these wonderful ladies when I am with them. Today, though, I want to give a shout-out to Susie Hallstrand! It is my privilege to watch her in action as a woman of faith, a wife and a mom. She is fully engaged in her current season of life, being an advocate for her children as she helps them find God’s design for each of their lives. She does all she can to give her husband the room to pursue his purpose to the best of his abilities. She is steadfast in her principles and is not afraid to do her homework to learn more and get better. I appreciate her example and friendship more than I will ever be able to express, and I learn something from her every time I spend time with her. Happy Mothers Day, GF!! This poem has hung on my refrig for nearly 25 years now. Not only does it remind me of things I may have learned as a child growing up that should never be repeated, but it has also served me well in trying to raise the children I was blessed with in my home during various points in their lives, including my daughter. Here it is & it’s my prayer it will bless other’s along their life’s journey. Thank you Terri for this wonderful idea! All of these beautiful responses are so inspiring to read. I have been blessed to be surrounded by some fantastic mothers! Anna Huber and Jenn Golden have been an incredible example of how to be loving, serving mothers and yet still pour out love and time to their teams. My grandmother, whom we recently said goodbye to, who instilled an incredible legacy of the Christian faith, the importance of family, and a life of service to her kids and grandkids. She showed us all what true wealth really is! My beautiful sister, who only got to be a mother to her son for his 18 days on this earth, but gave him all the love and care she could in those few weeks. She (and her husband) put their faith in the Lord, put their son’s needs first, and did what was best for him. Even once he passed away, my sister has continued to thank God for the short time they did have with him. My mother-in-law, who gives all she can to her family and never once thinks of herself. She has so many things she could be negative about, but she maintains one of the most positive, uplifting attitudes I have ever witnessed. And to my own mother, who I can never really thank properly for everything she has done for me. She has been by my side through some incredibly difficult trials. She has poured out love, time, and compassion even when I didn’t deserve it. 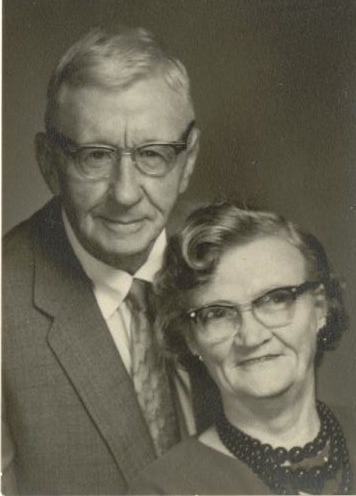 She gave her kids the foundation for a life built firmly on the Christian faith. She has been an incredible example of what a Godly mother and wife should be. I am so blessed to call her Mom! Thank you for the shout-outs to your grandmothers, Terri, and for the opportunity to give a shout-out in memory of my own mother: Sarah Jane Prescott Beale. Mother was a member of The Greatest Generation, born in 1915. She was the 6th of 11 children born to a south Georgia pioneer family. “Sally” worked on the family farm alongside her 8 brothers, raising tobacco and sugar cane. When the depression came in 1929, the family was self-sufficient because they raised everything they needed. Mother picked cotton for 3¢ a pound, went to Georgia State Women’s College for 2 years to get her teaching degree (yes, that’s all it took back then), and taught in a 2-room country schoolhouse for 4 years. When she married, she became a full-time wife and mother to, eventually, 5 children. You bet she worked every day—cooking, cleaning, sewing, mothering, running a pre-school at home, being a room mother at our school and a den mother for my brother’s Scout troop. She learned a few things at her mother’s old wood stove, because my husband always said that Mother could even make shoe leather taste good! She and Daddy lived on the same street for 59 years, and she was the best neighbor anyone could have wanted. When Mother had been a widow for 13 years, she contracted cancer at the age of 88. Those final 2 years of her life were a testament to the strong pioneer stock from which she came. She had shown her 5 children, their spouses, the 16 grandchildren and multiple great-grandchildren how to live well, and she proceeded to show us all how to die well. Driving her car and volunteering each week at the nursing home continued until the month before her death. Her 90th birthday party was a bittersweet celebration of her life for us, knowing the suffering that was to come, but the joyous service of her homegoing 2 months later was one of the grandest days of my life: Mother was “home,” whole, and rejoicing with Daddy in the presence of our Lord God and His angels. I bless my mother’s name for all she did for me, taught me, cared for me, and meant to me during the 65 years of my life before she went to heaven. I want to give a shout out to a good friend of mine name Katy Ewers who is a proud mom of a beautiful 3 month old. She had a up and down pregnancy full of scares, but always remained positive, all while being scared and vernable. The shout out really goes to the positive change I have seen in her since her beautiful baby has arrived, she has made a plan to be debt free, organized and orchestrated a march of dimes team that raised over $1300 all while she maintains a house, a full time job, full time breastfeeding(we all know the challenges this endevour can entail all in its self), a marriage, and friendships! She is a great mother who loves often, gives freely, and takes time with her family. She is a beautiful strong mother,wife,and friend and I proud to say I know her!!! A shout-out to my “Little Mommy”, as I call her. My mom got pregnant with me at 19 and I am so thankful she chose to keep me…I don’t think aborting me was ever on the table, but I know that having me made life more of a struggle. But she is a tough cookie and she made it work. My mom is and was a hard worker. There has never been a moment in time when I have doubted her love for me. I remember every night before bed she would lay in my bed with me and read or tell me stories and pray with me. She has always put us before herself, even now, she is watching my 5 year old son while we pack up our whole house and move across the country!! She is a dedicated mom and grandma! I love her so much! I Love all of your Letters to Lindsey, so Thank You for letting us share in on this one. I am writing this on your Blog as well as for my mom, I plan on giving it to her for Mother’s Day. So Thank you for giving me this forum. We have recently moved here to North Carolina and have had the Blessing to bring my mom with us. It was not an easy decision for my mom to give up her “space” and move in with us. She has said she never wanted to be a burden or impose on my family. Even though we respond by telling her, she is part of our family. Even before she had her house on the market she had just mentioned that she was thinking about moving, my kids drew up a contract on a restaurant placemat and made her sign it. The contract stated that if she ever sold her house she would have to move in with us! In all honesty it has been an adjustment for her as well as for me and my husband and kids. I think what keeps me in check when things may get a little sticky is to remember that one day she won’t be here, she will be in heaven. Oh my just typing that brings tears to my eyes. My mom is truly a wonderful gift from God. She is the strongest working and strongest willed woman I know. She has a never say quit attitude. She has the most amazing work ethic. She has so many talents, sewing, knitting, crocheting, quilting, needlepoint, painting, canning, cooking and loving. All of these talents she excels in. There are things she has said she was going to try and has mastered. Her life has not been easy. I have often told her she should write a book. My grandmother could have made a different choice and she chose life. You see my grandmother was raped at age 15. Then thrown out of her home. I know where my mom gets most of her strong personality traits from. It was my grandmother, her mom, she did anything and everything to give my mom a life. It wasn’t a charmed life or easy by any means, it was a labor of love. I pray that God gives me many, many, many more years with my mom. And when her time comes and she gets to Heaven, I know God will say, ‘Well done thy good and faithful servant.” because to me that’s what being a mom is all about. I love you Mom. Happy Mothers Day. Eres mi corazon, mi alma y mi higado. Terri, what a great idea, thank you for this post. It is so inspiring to read about all of those amazing mom’s making an impact. My shout out goes to my amazing sister, Kim. She has never had the blessing of giving birth to her own children and for that reason she finds Mothers Day very difficult. She and her husband made a choice to parent high needs kids through fostering. I admire her for the choice she made, it wasn’t an easy one. She was a loving caring mom to many. She demonstrated Christ’s love for those kids when they lived with her and still to this day as she stays connected to many of them. She gave a mother’s love to those who didn’t have it elsewhere. For all of them and from myself, Happy Mothers Day Kim! This shout out goes to mom, Lisa Delzeit, who daily gives of herself to her family with 3 kids. One of her great kids has a birth disease which requires daily rituals of medicine and treatments that would exhaust most people. Despite this “normal ” state and various hospital stays she keeps her family together and active and builds a team of leaders with LIFE. Her husband said it best during one of their daughter’s hospital stays, “this isn’t their daughter’s disease to deal with, thier their family’s to deal with. ” And they battle it together, in love. Shout out to several amazing moms, my Mom Diane for always telling me I can be anything I want to be and not to be afaid of the fight. My grandmother Arline for showing me how to have grace and patience with people. My grandmother Reva (passed) for always believing in me. My step grandma Genevia for showing me love was the best family tie. These ladies were /are my heros growing up and I can never repay them for making me who I am. Special shout out to friends Dorothy raising 3 children on her own with her youngest (1 year old) boy being special needs having his second heart surgery. God bless her! She runs on no sleep for days for her children. This is awesome Terri! Thanks for providing this opportunity! I would like to give a shout out to my mom! Tho I didn’t grow up with the example of a Christian household, my mom gave the most amazing example of generosity and tremendous work ethic! She was mom AND dad for my siblings and I. She tried hard to be there for us kids while working many times 3 – 4 jobs to not only make ends meet but also to NOT have to be on government assistance; tho this did occur more times than I can count! With that said, she would give the shirt off her back to anyone she saw in need! It was an amazing witness given the circumstances!!! I thank God for my mom and her example of relentless determination to take ownership of her life and doing her absolute best! WowTerri Incredible idea! My mom raised 15 kids and ran a very well run farm. We never went without food or clothing and she made sure we were raised with God in the house. He was first and foremost. My mom did it all and I am so proud of her. My brother Steve Maas and I have an incredible and an amazing mom. This shout out goes to my mom. There were 5 of us kids, and my parents went to everyone of mine and my sisters band concerts, parades, marching band football games, pep band basketball games, and my brothers football games when we were younger. When we started having kids of our own, my parents went to many of their sporting events, or choir concerts, 4H activities. I always thought that is what all parents did until I was an adult and found many people who never had their parents attend any of their activities. Thank you Mom. This post was touching ! You’re such an inspiring mom, super example for us . Terri, what beautiful ” shout outs”! My shout out goes to my own amazing mom Doreatha Markel. She never ceases to amaze me, even at nearly 86 years young. My mom taught me as a young girl how to make chocolate chip cookies”the way your dad likes” with a little extra flour. I learned from her (and her mom ) my love of quilting and canning. She was a young widow left to raise 4 teenagers alone. During this time I witnessed her faith in “not my will but Yours be done”. Today my mom still quilts and volunteers. She manages to find time to sew bathing suits for tiny stuffed bunnies that are loved by her grandchildren. And she lovingly listens but tells the truth to older grandchildren who trust her enough to share their lives ( even from as far away as San Francisco and Norway ). She really has been and continues to be an inspiration to me and many others whose lives she blesses. Happy Mother’s day mom! My shout out goes to Donna Barlond, my inspiring mother! She has overcome much in her life. From childhood poverty – growing up on a mountain in Kentucky with minimal food, salvation army clothes and no indoor plumbing- to struggling with disorders, diseases and being deathly ill with septic pneumonia. She wasn’t always able to give us what we wanted, and sometimes what we needed, but that makes me appreciate what we did have more. Her strength and love for life inspires me to be the best mom I can be to my children. Her humor reminds me to be silly sometimes and encourage silly with my children. Her love teaches me to love unconditionally all of Gods children. And her smile tells me all I need to hear. Thanks Terri for giving us a forum to convey our feelings! Hi Teri, I want to give a HUGE shout out to my Mom, Jean Marquess!! She died of cancer when I was 12yrs old. She was was my best friend, but also a disciplinarian. Believe you me I never got away with anything! She was my softball manager for many years as well as my girl scout leader. During the summer she took us took us to the lake (there was 6 of us I was #5) when we were not at our summer cottage; where we did spend most of our summers. She would take us boating, fishing, etc. It was from her I learned the love of being by the water, and of watching sports such as: U of M football, Lions, Tigers, etc. She treated us all fairly. She was my younger brother’s boy scout leader and I remember going to many of my other sibings games and such!! She was so much FUN and an AWESOME MOM!! I still miss her to this day!! P.S. Thanks Teri for allowing all of us to share our Amazing stories about Moms!! You are the BEST EVER!!! Mi madre es una mujer muy talentosa. Puede coser y hacer qualquier cosa. Una vez diseño un hermos vestido de novia en solo un par de dias, sin muestra, cinta de medir o una clara idea por parte de la novia. Es activa, siempre dispuesta a brindar ayuda. En su juventud fue compositora de cantos y cantante. Nos enseño a cantar y bailar y siempre hacia todos nuestros trajes para presentaciones. My Sister-in-law Brooke is one of the most patient, fun, cheerful, hardworking, and has a “nothing is a big deal” mentality. She is a mom to four beautiful daughters with the oldest being seven. She has modeled Christ’s love to many people. Not by being flashy, or trying to get attention she just has a beautiful spirit about her that makes being around her inviting. For that I want to giver her, a big shout-out for being a great role model to me! My Mom deserves many shout-outs. My mom could have played the victim card in life however; she decided to have the courage to seek a new family tradition. She grew personally to make sure my dad, sister, and I, had a mom (wife) who was available for her family. She found women she could model and had the courage to grow herself, her marriage, and two daughters. With her hard work and God’s grace she has done a great job! Thanks MOM! Lynn Mossner needs many shout-outs! She is a godly woman who has had a lot on her plate this past year, however you wouldn’t know it. She has handled life’s curve balls with grace. I thank her for showing me which curve balls are worth a SWING! and which are better to let pass. Thanks for all the Letters to Lindsey, keep them coming! A little late on this blog, but I would like to make a shout-out to my grandma Bernice. She is 94 years old. Her house is open to everyone, and always has to have something in her planner for the day. She still braids her own rugs. She makes her own cards for every occasion for all children, grandchildren, & great grandchildren. She makes towels for everyone in the entire family for Christmas. The more get-togethers the better. The more the merrier. She loves God and is a wonderful example of that. Her memory is better than mine. Sharp as a tack. Funny. Easy going. Loves life. Loves people. She has had a great influence on me. I love my grandma! What a fantastic way to spend an evening, reading such positive messages about the moms in others’ lives! I thought I had some pretty big shoes to fill from my own mother and grandmothers (all of whom never cease to amaze me with their resourcefulness, confidence, tenacity, and faith), but reading through these other shout-outs gets me so excited, knowing that my journey to being the mom God wants me to be will be a wonderful, life-long one. Thanks for sharing! SHOUT OUT to my Mom, Shirley Tucker. She is and always has been so incredibly generous! She can’t stand the thought of one of her kids not having the money to get a burger if they want it. Or have spending money on a fun excursion with friends. She would give me her last dime just so I could get the earrings I was admiring. And for many years she has helped us make ends meet by paying for groceries every week or giving us $20 for gas. She loves to give and even though she is currently in the nursing home recovering from congestive heart failure, she still bought me anything I wanted at the Bazarre they held there. I try to give back as often as I can, but I will have keep giving until my dying day to even come close to her level of giving and thoughtfulness. I am blessed with an awesome Mom! I’d like to give a shout out to several moms- the first being my own, for ALWAYS being there for me, no matter what! I learned how to be independent, fight for injustice and that food does more than feed the soul, especially in times of crisis. The next shout out is to my sister, Lisa, mom of 4! I don’t know how she does it, but she manages to make everything from scratch (even butter! ), bakes the most beautiful cakes & desserts, sees all her own curtains, bed coverings, baby clothes, and soo much more. She is creative and talented and loves on her kids so much!!! My last, but not last shout out is for a mom that I’ve never met, although I feel as if I have. Her amazing transparency, willingness to serve God and others, her sense of humor, her huge ability to love on people, including her 4 children, her never ceasing desire to always improve herself and strive to be a better person is just amazing to me. Although she is no longer with us, I know that Jackie Lewis is looking down from heaven and smiling! I want to first SHOUT OUT to my mom, Barbara French, who raised 5 kids on an amazingly tight budget and still taught the values of hospitality and wealth being in relationships and not only in what’s in your wallet. She didn’t know how to cook when she married Dad, and not only turned into a good cook, she learned (and taught her daughters) how to stretch a limited amount to feed many. Sometimes we swore Mom was 3 parts witch, when she would scold us from the basement (where she was doing endless loads of laundry) BY NAME, when we were misbehaving 2 stories above! Mom learned to drive when I was in middle school. Mom loved learning. She’d turned down a full-ride scholarship to a prestigious university to marry Dad, and went to community college, because she just couldn’t stand the idea her kids were preparing for college and she’d never done it herself. Mom loved Jesus. Her dearest wish when she was dying recently was to be remembered as a woman who loved the Lord first, and her family second. Mom’s mother had deep clinical psychological issues that made her vain and selfish, but Mom came out of it escaping almost all of her mother’s issues. Mom was so selfless in her love for her family, always putting our needs before hers. She wore second-hand clothes so we could have shoes that fit. Family meant everything to Mom. It hurt her deeply to watch all but 2 of her 5 children move to distant places (2 other states and another country). Whenever my siblings visited, or she visited them, when it was time to part, Mom always teared up. The day she died, after many hours of being in a coma, Mom woke up moments before she died, and looked at each of us in our turns with tears in her eyes. We knew it was her way of saying her last tearful goodbyes. I also want to SHOUT OUT to my mentor and best friend, Cindy Phillips. Because of Cindy, I am a better wife, mother and friend. Cindy inspires me, gently rebukes me, encourages me and loves me in spite of myself. We have been friends since college, too many years ago to admit here! Cindy is closer to me than either of my sisters, surrogate aunt to my children and Godmother to my oldest granddaughter. To all the Moms out there, HAPPY MOTHER’S DAY!!! I LOVE that Erma Bombeck story!! One of my favorites:) Thanks for sharing! I am posting it on my own blog Sunday. Thanks for reminding me of it!! My mom is stronger than I had realized when I was younger, little by little I learn more about her and her strength to overcome what she had to in order to provide for me. Words are not enough to thank her, I pray with God’s guidance as well as her continuing support for the best for me that I may one day pay her back for everything in some form or fashion. To my son’s Nana Patsy- thank you for your patience and love given to us both. She is equally strong if not stronger in that she battled and survived breast cancer and is my once a month saving grace of relief, I know as mom’s we don’t really get “time off” but she let’s me have some time for quiet and reflection and work on me. She raised her son for a long time by herself and is ever present in her grandson’s life. To my grandmothers thank you for teaching me to sew and be crafty, as well as sharing your love and wisdom. It is not forgotten. I love each and every one of them very much.